Tom Lees' second-half header was enough for Sheffield Wednesday to beat Bolton Wanderers and secure the Owls' first win in seven games. The Wednesday captain glanced Joel Pelupessy's corner past Ben Alnwick in a game where quality finishing in front of goal was scarce for both sides. Clayton Donaldson had a chance to level for the visitors near to full-time but the forward scuffed his shot well wide to continue his dismal run of 28 games without a goal. The defeat means Phil Parkinson's side extend their winless run to nine games, the longest in the Championship. Steven Fletcher returned to the Wednesday starting line-up after missing the weekend defeat by Derby, but the Scotland international was forced off shortly before half-time. The striker, who was a handful for the Bolton defence in the opening stages, is still managing a knee injury which sidelined him for the second half of last season. Adam Reach's half-volley was the best chance the hosts had to take the lead in the first half, but his effort from the edge of the box looped over Wanderers keeper Ben Alnwick and dropped wide. Sammy Ameobi tried his luck from range on several occasions, but the Bolton winger failed to really test Wednesday shotstopper Cameron Dawson. "We didn't find our way in the first half and could not find our way to combinations and chances, there was pressure on the game. "But we started the second half well and got the goal, had more of the ball and gained an important win with a clean sheet. "This is a small step forward and we want to make another on Saturday in another important game. "I am happy for the team and the fans but now we must have new spirit and find a new way to come to a positive result at Blackburn." "I thought first half we controlled a lot of the game. At the start of the second half, I thought Forestieri coming on gave the crowd a lift and them a huge lift. "We didn't start as quickly as we needed to to respond to that, and that start to the second half has cost us the game. One moment has separated the two teams. "We had gone to chase it towards the end and become a bit disjointed. We had some good half chances and got in some very good positions. 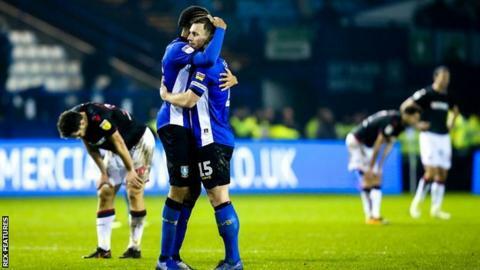 "On the night you could sense there was a lack of confidence from Sheffield Wednesday. I felt the game was there for the taking tonight. "Our goalkeeper has hardly touched the ball or had a save to make." Match ends, Sheffield Wednesday 1, Bolton Wanderers 0. Second Half ends, Sheffield Wednesday 1, Bolton Wanderers 0. Attempt missed. Adam Reach (Sheffield Wednesday) left footed shot from outside the box is close, but misses to the right following a set piece situation. Ashley Baker (Sheffield Wednesday) wins a free kick on the right wing. Foul by Yanic Wildschut (Bolton Wanderers). Attempt missed. Lucas João (Sheffield Wednesday) right footed shot from the centre of the box is too high. Assisted by Adam Reach with a through ball. Substitution, Sheffield Wednesday. Lucas João replaces Marco Matias. Corner, Sheffield Wednesday. Conceded by Jack Hobbs. Substitution, Bolton Wanderers. William Buckley replaces Marc Wilson. Attempt missed. Joe Williams (Bolton Wanderers) right footed shot from outside the box is too high. Attempt blocked. Fernando Forestieri (Sheffield Wednesday) right footed shot from outside the box is blocked. Attempt missed. Clayton Donaldson (Bolton Wanderers) left footed shot from the centre of the box misses to the left. Assisted by Christian Doidge. Attempt missed. Barry Bannan (Sheffield Wednesday) left footed shot from outside the box is high and wide to the left. Assisted by Atdhe Nuhiu. Foul by Christian Doidge (Bolton Wanderers). Ashley Baker (Sheffield Wednesday) wins a free kick in the defensive half. Corner, Bolton Wanderers. Conceded by Michael Hector. Attempt blocked. Sammy Ameobi (Bolton Wanderers) left footed shot from the right side of the box is blocked. Assisted by Christian Doidge. Substitution, Bolton Wanderers. Clayton Donaldson replaces Pawel Olkowski. Substitution, Bolton Wanderers. Christian Doidge replaces Josh Magennis. Attempt missed. Sammy Ameobi (Bolton Wanderers) left footed shot from outside the box is too high. Assisted by Joe Williams. Goal! Sheffield Wednesday 1, Bolton Wanderers 0. Tom Lees (Sheffield Wednesday) header from very close range to the bottom left corner. Assisted by Joey Pelupessy with a cross following a corner. Corner, Sheffield Wednesday. Conceded by Mark Beevers. Attempt blocked. Barry Bannan (Sheffield Wednesday) left footed shot from the centre of the box is blocked. Assisted by Fernando Forestieri.